The Star Press plugged both of RMR’s showcases this week in Muncie. On Tuesday, March 27, Rock Music Review will offer up a showcase at Mo’s Tavern in The Village. The all-ages show (yes, all ages) will include No Heroics, Please; This Story; Annabel (Kent, Ohio), and Obsequies for Juliet. Want some electronic dance music? Then head to Doc’s downtown on Thursday, March 29, for a Rock Music Review show featuring Indianapolis DJs. The lineup consists of some of the best club thumpers, including electro, funky house, trance and more, according to Rock Music Review’s Jack Shepler. DJs will include Mark Tester (former All Access intern and Ari.Ari member); DJ Fate; Jackola; DJ Bee Ryan, and DJ Decibel. 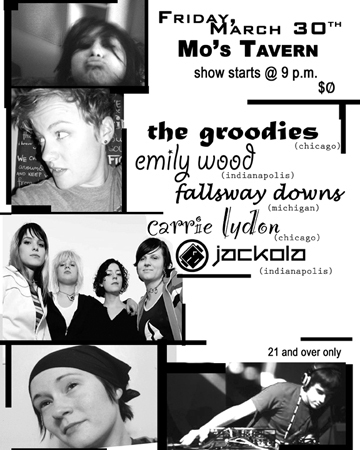 Ball State’s Women’s Studies Department is having a night of music on Friday, March 30 @ Mo’s Tavern in Muncie, IN. I get to close out the night of women performers with such good old fashioned house music ;). If you live in Muncie and want to get out and dance, your only options do not include much electronic dance music (EDM), so Rock Music Review is bringing it to town! Featured on the lineup are Indianapolis DJs and former Muncie-ites alike. This night will feature some of the best electro and funky house. This will be a great night for those that love to dance but can’t make it down to Indianapolis, or for those unfamiliar with EDM and want to experience something new! Doc’s will have drink specials that night as well: $3 Long Islands, $6 Bucket-o-beer (4 longnecks), and $1.50 Miller Highlife. All DJs on the bill will be spinning vinyl records. I’m opening for Myspacer-gone-famous hip-hop artist Mickey Avalon, Andre Legacy and Dirt Nasty tomorrow night at Talbott Street. I’ll be spinning top40, hip-hop, and some mashup goodness.